Oh noooo, a new article in The Atlantic says that the huge increase in the numbers of visitors to Antarctica in recent years may be making the penguins sick. A team led by Wray Grimaldi of the University of Otago in New Zealand found multiple infectious agents, including Salmonella and E. coli bacteria and West Nile virus in captive penguins dating back to 1947. A paper based on the team’s work published this month in the journal Polar Biology (paywall) reports that outbreaks of disease from those pathogens have killed thousands of penguins over the years. I sure hope our intrepid polar explorer kitteh didn’t bring along any toxoplasmosis from home. 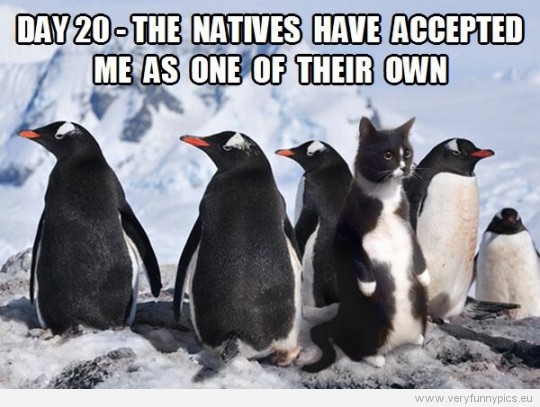 This entry was posted in Science Caturday, Uncategorized and tagged Antartica, penguin cat, Polar Biology, science lolcat. Bookmark the permalink.